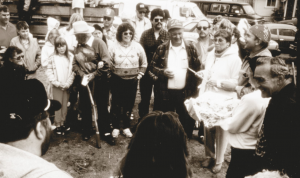 Coquille members revived an ancient tradition in 1988, holding their first annual salmon ceremony in Bandon, Ore. Deprived of federal recognition in 1954, the Coquille people struggled for decades to regain their Tribal status. Finally, on June 28, 1989, Congress restored the Tribe’s trust relationship with the federal government. The Coquilles once again were recognized as a sovereign Indian Nation. Restoration was both a moral victory and a practical one. Public Law 101-42 restored the Tribe’s eligibility to participate in federal programs and to receive federal funds for education, health, and law enforcement programs. It re-established our Tribal government’s ability to exercise political and legal jurisdiction over its lands, businesses and community. Passage of this crucial legislation rapidly led to other milestones: adoption of a Tribal Constitution; construction of The Mill Casino; designation of the 5,400-acre Coquille Tribal Forest; and establishment of health, education and housing services to Tribal members. Restoration Day, celebrated each June 28, remains the most joyful day on the Coquille Tribal calendar.